To shop online, pay with Paypal using your credit card or bank account; it's secure. Online purchases include a small transaction processing fee. Shop by mail using this shopping form. If you would like to arrange for local pick-up, please call (804) 839-2407. Thank you for shopping with Henrico County Historical Society. In 2013 Meadow Farm celebrated its 300th anniversary, dating to 1713 when William Sheppard first received the original land grant. Mosby Sheppard built the existing house in 1810. The property was later acquired by Dr. John Mosby Sheppard. Seven generations of the Sheppard family lived at Meadow Farm. In 1974 Meadow Farm was listed on the Virginia Landmark Registry and the National Register of Historic Places. 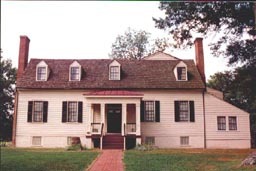 In 1975, Elizabeth Adam Crump (wife of the late Adjutant General of Virginia, Sheppard Crump) donated the property of Meadow Farm to the County of Henrico and it was opened to the public as Meadow Farm Museum/ Crump Park in 1981. Although restoration had been completed in the late 1970s to preserve and interpret Meadow Farm, damage from Hurricane Isabel in 2003 presented the County an opportunity to re-examine documents pertaining to the original house construction. Mosby Sheppard and his son John Sheppard built Meadow Farm in phases. Both men carefully documented the purchase of building materials and labor for work done between 1809 and 1858. Museum staff interpreted in detail the material, labor, and expense involved in constructing a home in 19th-century rural Virginia. During the restoration process the chimneys were capped off which then prevented the demonstration of 19th-century food preparation. Archaeological inspection of the property located evidence of an outdoor kitchen once used on the property as was often the custom of homes of the time period. The Henrico County Historical Society in partnership with Friends of Meadow Farm and other organizations in the community have begun a series of events to raise funding for building an outdoor kitchen at Meadow Farm. We feel that it is an especially important feature to demonstrate to schoolchildren where their food comes from other than from the grocery store and how to prepare it. Consideration is also given to the interpretation of slaves who likely prepared the food at Meadow Farm and the African influence in American culture. Your donation makes possible our goal of completing Meadow Farm&apos;s interpretation of Henrico history for the benefit of future generations. Donations may be made by check mailed with the Meadow Farm Kitchen Mail-in Form or by Paypal button below. We thank you for your support of this worthwhile project.